I finally saw Marvel's "Avengers: Age of Ultron" this past Saturday and I loooved it! Carrie and I are going to discuss it for our next Fiction Kitchen podcast episode, so I'll share more of my thoughts about the film there, but I did want to share this fiction food inspiration with you. 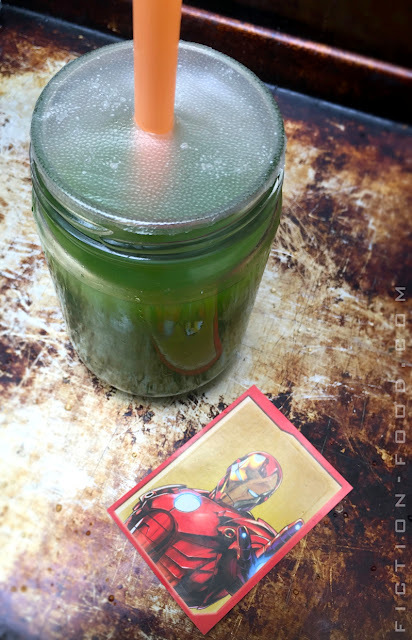 One of the first instances of food in the movie is a dark green drink made by Tony Stark for the team (well, Natasha & Clint had some) after they come back to Avengers headquarters from fighting Baron Struker's forces in Sokovia. Tony's talking away, to Bruce maybe? I can't remember exactly (I need to see it again! I want to!) but his hands are busy fixing up a few of these drinks. Clint is getting patched up in the infirmary and Tony takes one to him and gives one to Natasha too and has one himself. They drink it like it's no biggie and the usual thing. I like that type of inclusion in visual medium. It makes the world of the film feel bigger and more whole, aside from only what we're shown or get from the dialogue. You feel like, yeah, this must be something they do after every battle, to re-energize and take care of themselves. That's just good storytelling; showing, not telling, and conveying the feeling of 'more' than what you see. 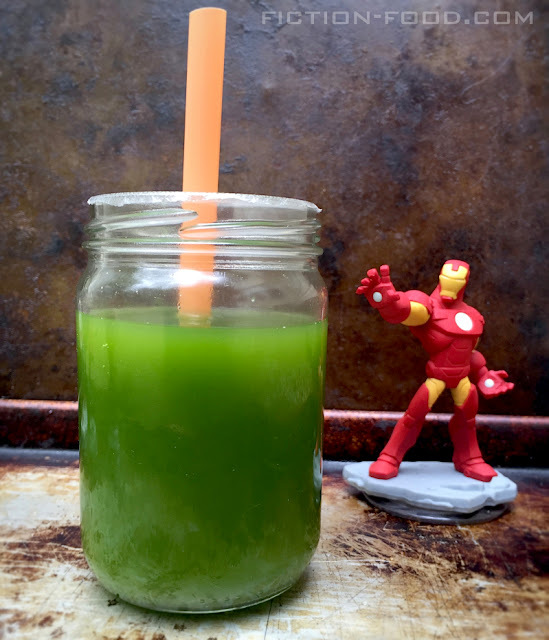 The drink is a call back to "Iron Man 2" (actually, the first and maybe the third, too) wherein we see Tony downing some chlorophyll (green plant matter) in order to combat the radioactivity and paladium in his body (well, at least to try to help things not get hecka worse, hecka fast). It's science, y'all! And it was actually Robert Downey, Jr's idea. Whaaat? 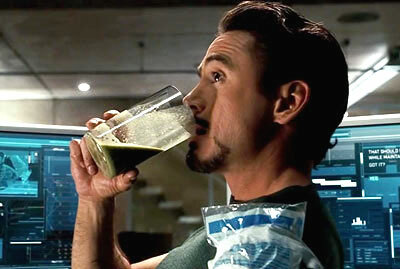 So, the green healthy drink is now Tony's thing and he totally shares it with his buds. And did you notice that he wasn't all about the alcohol this time around? I mean, I assume he had some at the party, but it wasn't a 'thing' like it has been in past movies (well, the "Iron Man" movies anyway). So looks like he's been getting his life together. Maybe. Well, but then there's his future-fear dream and Ultron and all...Pepper, he neeeeds you! Note: Liquid chlorophyll can be found in health food stores or you can buy it online (Amazon sells it). If you get some for this recipe make sure you read the container for amounts. Also, spirulina is another super health supplement with chlorophyll that would be perfect for this drink. Also, also, throw some fresh parsley into the recipe below if you like, it's a good source of chlorophyll too! Green plants, yo! For the recipe below I used foods that contain chlorophyll (kale), vitamin C (pineapple), natural sweetness (apple and pineapple), easily digested carbohydrates and potassium (coconut water), protein (protein powder), something to help a potentially upset tummy, nausea, and headaches (ginger), and a painkilling and anti-inflamitory component (ginger and tonic water with quinine). 1. Combine all of the ingredients in the blender & blend until smooth & pretty green. Place the cloth over your pitcher & pour the liquid into it. Gather the cloth up & squeeze the juice into the pitcher below. Discard the pulp left in the cloth. Serve in a small clear glass or cup with a straw (I used a small jar with press cling wrap on top, poked through with a straw). Yeah! It totally stood out! I like that, after battle smoothie, it just makes sense, right? Taste bad I reccomend adding redbull or sprite to flavor it. Vitamin Green tea is what I take before breakfast every day. I make Green energy drinks smoothies with wild blueberries, fresh ground Flax seed and juice or other tea, and add a banana and this is what I have to start my day.